When it comes to steel building assembly, no other company offers easier instructions. Your Powerbilt metal building or steel home is shipped from the factory with an easy to follow steel building assembly manual. When your steel building arrives, it would be helpful to unload and lay out the different components in their order of assembly, and be sure to check all parts against the shipping invoice to confirm that you have received everything that you need for your steel building assembly. As you will be constructing your steel home from the bottom up, the place to start is with the concrete foundation. Powerbilt recommends that you pour a simple floating concrete perimeter with trough for the steel arches. Base connectors are available for existing foundations. Next, slide the assembled steel arches into the foundation trough and raise to an upright position. If you are assembling and erecting half arches, basic supports or scaffolding will hold them in place and speed up the erection process. 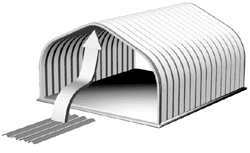 Continue progressively raising and joining the arches together to form your steel home. Precision engineering ensures that the arches will fit snugly together. If you are working with half arches, you can lap and bolt them together to create a full arch. Next, seal the arches at their base with concrete if you are working with a trough or bolt them to their base connectors if you are working with an existing foundation. You are now ready to add finishing touches to your steel home or metal building, such as endwalls, doors, insulation, windows, ventilators, and skylights.